One year has passed since 26/11 (the terror attacks on Mumbai on November 26, 2008), the biggest terror attack India has ever witnessed. Still there is a feeling of sadness and anger among the people of India. The country cannot forget how the ten terrorists, sponsored and supported by Pakistan, entered and attacked the commercial capital of the country. Four important places in Mumbai were targeted and 183 people killed, over 400 injured. Members of security forces also lost their lives. The fiasco ended after 60 hours when nine out of 10 terrorists were killed and the 10th terrorist, Ajmal Aamir Kasab, was caught alive. 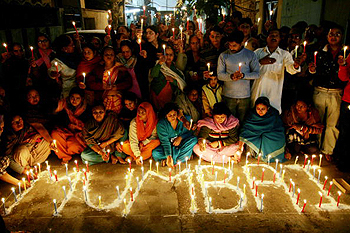 Kasab is still under trial, and the entire country is eagerly waiting for his execution. Undoubtedly, nobody can feel more pain than those who lost loved ones. But the people of the country today want to know, a year after 26/11, what we learned from the incident and what steps are being taken to avoid repetition of such an attack. The country also wants to know whether Pakistan too has learned from 26/11. Has Pakistan now decided not to let the terrorists operate from its soil to attack India? And what is the position of the same Pakistan-sponsored terrorism in Pakistan? Is the demon of terrorism under the control of the Pakistan army and Pakistan administration or not? If we look at the social and political situation in the country a year after 26/11, we can see that cooperation between the Centre and the states to fight terror has increased. For quick response to any terror attack, many steps are being taken to increase the commando strength. Anti-terror teams of commandos and special zones are being set up. Modern ways are adopted to keep a watch on the coastal borders of the country, and the strength of the Coast Guard has also been increased. Other steps related to security are in progress. All political parties are united on the issue of fighting terror. Security arrangements are ensured in sensitive places in the country. The government of India is trying to shield the country from terror attacks on the lines of post-9/11 America. As far as the social situation is concerned, after 26/11, the country has also become more united across communities and regions. The entire world saw that the Muslim Council Trust of Mumbai declined to bury the bodies of nine terrorists in the Muslim cemeteries. The Muslim Ulemas also supported this decision of the trust by saying that the attack of 26/11 was entirely anti-Islam and inhumane. The consensus was that the terrorists involved in the attack don't deserve to be called Muslims and were therefore denied a burial place in a Muslim cemetery. While this attack united all castes and communities in the country, the people of the Muslim community organized peace marches as well as demonstrations against Pakistan in many big cities of the country. On the whole, we can say that, after 26/11, the country has become united in the same way as was during the Kargil war. As far as post-26/11 Pakistan is concerned, the entire world is seeing its deteriorating situation. As a neighboring country, India always wants a peaceful and prosperous Pakistan. India is aware of the fact that if there is fire in a neighbor's home, the heat is felt by the neighbors as well. But the condition of Pakistan has reached such a level that one can't hope easily for return of peace and prosperity in that country. The demon of terrorism created and nurtured for attacking its neighbors is now bent on destroying Pakistan itself. The headquarters of the ISI and the Pakistani army are the major targets of these jihadi forces. Daily there is more than one terror incident in Pakistan. Most of these attacks involve suicide bombers, suicide bombers who are the offspring of Pakistani parents, brought up by the socialization and education of Pakistan. Indians are concerned that, notwithstanding these facts and the image of Pakistan in the world, the people of Pakistan are still giving childish and irresponsible statements. Such irresponsible people sometimes decline to accept Kasab as a Pakistani—some Pakistani intellectuals start calling Kasab a terrorist related to the Hindu community because there was a red thread tied on his right wrist during the attack—whereas the former Prime Minister Nawaz Sharif didn't hesitate in accepting Kasab as a Pakistani citizen. Similarly, instead of learning lessons from 26/11 and committing itself to non-repetition of such an incident, Pakistani rulers are busy in finding the possible "hand" of India behind the disturbance and terror attacks in Pakistan, even if a Pak-based terror group takes the responsibility of the attacks. The testimony after 26/11 of the defense minister of Pakistan, Ahmed Mukhtar, is worth mentioning. In his testimony, Mukhtar publicly accepted that, had the Jamaat-ud-Dawa, the parent organization of the Lashkar-e-Taibi, not been banned, Pakistan would have been declared a terrorist state. As a result of such wrong decisions of nurturing terrorism, today the current and former Pakistani rulers are being seen saying that Pakistan needs sympathy, not accusations and criticism. No doubt, India has full sympathy with Pakistan, but first Pakistan will have to liberate itself from jihadis so that peace can prevail in Pakistan and India too can be saved from another 26/11.